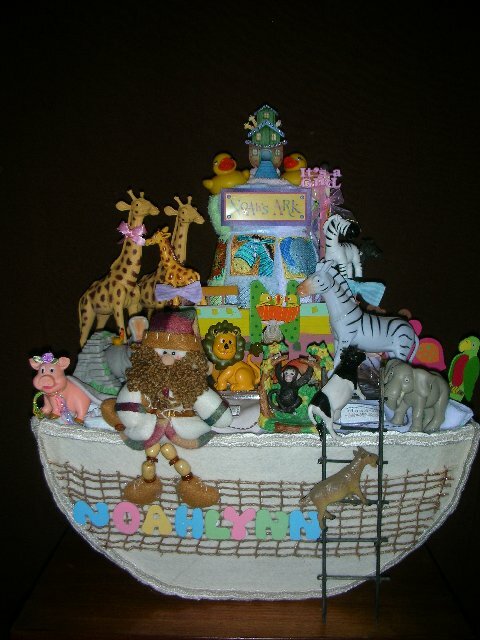 Amazing Noahs Ark Diaper Cake! What a creative, unique and delightfully fun Noah's Ark Diaper Cake! This will be an adorable addition to a baby shower. Everything from the animals to the shape of the ark itself, Artemisia has gone all out on this amazing diaper cake! Artemisia is one of our wonderful and creative readers who has submitted her diaper cake ideas and pictures to inspire and motivate the rest of us. 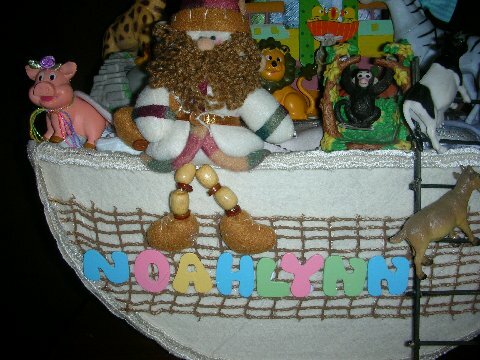 This website is the most helpful and complete resource of diaper cake ideas and pictures on the web, and it is made even more so by Artemisia's Noah's Ark diaper cake instructions. So Thanks a million Artemisia! I made this Noah's Ark themed diaper cake for a baby shower. It consists of 56 diapers, baby's blanket, bottles, lotion, baby powder and different kinds of animals. Noah's Ark is made of cardboard. The inside and outside of the ark is lined with felt. 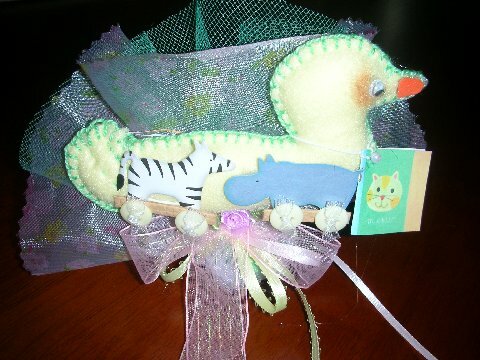 This favor goes with the NOAH'S ARK Diaper cake. It is primarily made of felt and contains almonds in a candy coated shell. Truly a masterpiece Artemisia - Thank you for sharing!! After looking at this Noahs Ark diaper cake, you just might want to learn how to make your own diaper cake - find Artemisia's VERY OWN easy-to-follow instructions right here!